At Le Houx, our jewels are carefully appraised by both of our two certified jewellery appraisers. We follow strict evaluation guidelines upon selecting the finest: therefore, quality is guaranteed on all of our products. For jewels used on engagement rings, we provide certificates by GIA, the world’s leading authority on diamonds, colored stones, and pearls. We will also go over the certificate with our customers for their correct understanding of the diamonds used on their ring. At Le Houx, we also use the finest quality ‘melee’ diamonds, which are the smaller-cut diamonds used for embellishing larger gems. We also provide diamonds certified by authorities other than GIA – we will work closely with our customers to accommodate any needs they may have. • What is GIA.GG (Gemological Institute of America, Graduate Gemologist)? Gemological Institute of America (GIA) is a non-profit educational institution and the world’s leading authority on diamonds, colored stones and pearls. Established in 1931 in the United States, GIA is also known as the founder of the “4C”, the International Diamond Grading System™. GIA.GG is a degree conferred to individuals who have completed the necessary programs at GIA, and is known as the most prestigious credential in the jewellery industry. Diamonds traded in Japan is also appraised according to GIA’s evaluation, which is mere proof of the authority of GIA. Gems and jewels are commonly used as accessories, but we believe that there’s actually more to it. They are minerals with special powers, affecting our body and spirit. This is believed to be one of the reasons why gems have been used as accessories since the ancient times. For example, diamonds are formed at a great depth near the Earth’s mantle, and the growth occurs over the period of millions, tens of millions or even billion years. They must arrive at the surface of the Earth in a particular speed. If this speed is too slow, they turn to graphite, not diamonds. Therefore only those that arrive at the surface at a certain speed – for example, with the help of momentum created by volcanic eruptions – transform into diamonds. It doesn't end here. Diamonds that meet the commercial standards in terms of quality and size only make up a small portion of those that make it to the surface of the Earth. This is why we think that diamonds, as well as other jewels, are priceless, scarce commodities: they are products of miraculous coincidences brought by Mother Nature. They give us a sense of empowerment. At Le Houx, we want to provide our customers the opportunity to encounter jewels for their own happiness and empowerment. We are dedicated in educating our customers so that they understand where their jewels and gems come from. We feel that this is one of our missions as professional gemologists. 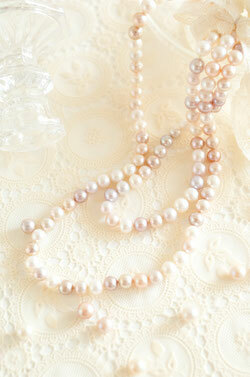 Hong Kong hosts four large jewellery shows annually. The jewellery show held every September is the largest tradeshow in Asia where exquisite fine jewellery from all over the world converges in Hong Kong. As a former British colony, Hong Kong remains a place that bridges the East and West, and is a perfect place to find great diversity in the selection of jewellery and designs. You may even come across commodities that are rarely traded in Japan. Le Houx welcomes customers from various locations: we are here to provide them with all the advantages that Hong Kong offers in terms of pricing and quality.